Texas Instruments started to investigate the design of a hand-held calculator in 1966 with the "Caltech" project. After a commercial tie up with Canon the result was one of the first hand-held calculators, the Canon Pocketronic of 1971. Texas Instruments was awarded U.S. and Japanese patents for a "Miniature Electronic Calculator". At first Texas Instruments was only interested in manufacturing the integrated circuits, but started test-marketing its first complete calculator, the TI 2500 'Datamath' in 1972. This was a great success and shortly after it was announced that TI "expects to announce a new calculator every 60 to 90 days for the next several months." 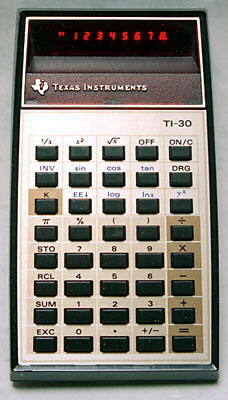 These were the first of a long line of Texas instrument calculators, which continues to this day. Texas Instruments was a pioneer in the integrated circuits for calculators and supplied a chip set for the Canon Pocketronic, one of the first hand-held calculators. The three integrated circuits can be seen in the photograph below. This is a featured calculator. 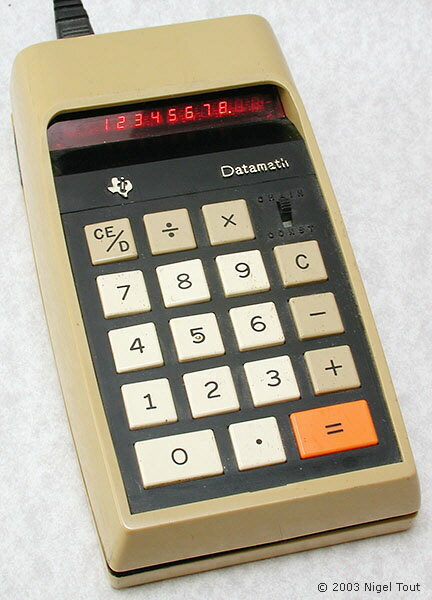 Texas Instruments TI 2500 "Datamath". Introduced in mid-1972 this was the first commercial calculator produced by Texas Instruments, and cost $149.99. Introduced in 1977, this model was very popular and a great number were sold, making it very common. Programmable calculator introduced in 1977, features semiconductor library modules for different applications. By using specially developed modules several very specialised calculators were produced based on this model. For further photographs of Texas Instruments hand-held calculators see the Calculator Photo Library on this site. TI Prototype and Preproduction Models Found! Texas Instruments Calculators 1972 - 1979: How rare are they? © Text & photographs copyright Nigel Tout 2000-2019 except where noted otherwise.